At the SET Max Stardust Awards, there was no sighting of the “Anarkali”. In fact, apart from Celina, almost everyone attending chose to wear a dress. Some wore it long, some short. My favorites were Meghna and Twinkle. What about you? What is an award show without that “one” ugly outfit! The outfit that sticks out like a sore thumb. The outfit that makes you go “WTF was she thinking”! 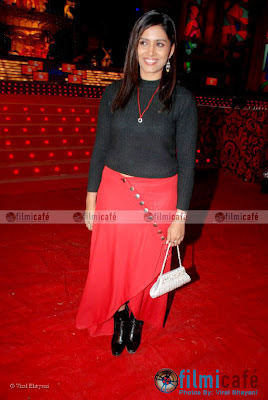 Worry not, this award show also had that one outfit and it wasn’t surprising that the outfit was worn by Sonali Kulkarni! Spotted: Bipasha Basu trying to get some golfing done in a pretty tight sheath dress. Did she not know she was attending a golf event? While we don’t care about her golfing skills, we do have an opinion about her outfit! We love the silhouette of the dress, love how she pairs it with a shawl, but the print on this dress is quite a letdown! What do you think? This outfit looked ridiculous on Neha. 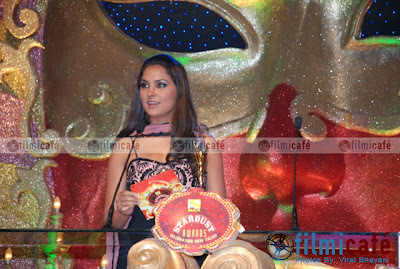 I can’t imagine why Lara Dutta also decided to wear it at the SET Stardust awards! Maybe the sponsors dictated her dress code!